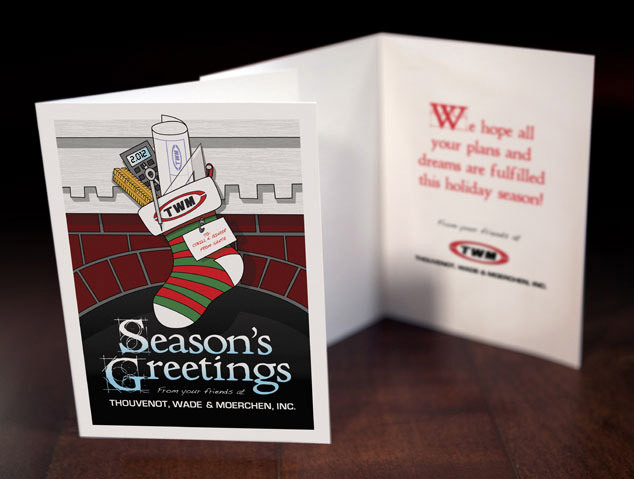 Visual Lure was recently contracted to design Thouvenot, Wade & Moerchen’s 2012 Christmas cards. This will be the third year we’ve designed a custom illustration for their cards. This year’s card features a stocking stuffed with engineering related objects, including a ruler, compass, triangle, blue prints and a calculator that reads 2,012. The name tag on the stocking reads: To: Cybil N. Gineer, From: Santa. Learn more about our graphic design services and don’t forget to check out our graphic design portfolio.